The Horizon Fitness Elite E7 Elliptical Trainer is On Sale! The Horizon Fitness Elite E7 elliptical trainer is designed around the ergonomics needs of the user. We used to feel that Horizon ellipticals were starting to get stale, and they were falling behind some of the technological advances made by other fitness equipment companies. With the new line-up of Horizon machines they are once again at the front of the pack in both quality and innovation. There is a drive in the fitness equipment industry to merge machines with interactive technology and the Internet. Buying exercise machines is all about reaching your fitness goals, whether that may be weight loss or an overall healthy lifestyle. The numerous features on the Horizon Elite E7 elliptical are designed to do just that. Horizon Fitness is built by the third largest manufacturer of fitness equipment in the world – Johnson Fitness. It’s the same company that builds Vision Fitness and Matrix Fitness. Smooth Elliptical Stride – The Elite E7 uses a combination large drive pulley ratio and a heavy 23 lb. flyhwheel to create a smooth and efficient elliptical motion. Narrow Pedal Distance – One of the benefits of a front drive elliptical trainer is that you can place the pedals very close to each other, this reduces stress to your hips. Wide pedal separation can be particularly stressful to women. On the Elite E7 the pedals are about as close as you can get. Optimal Handlebar Spacing – Handlebars are at a 45 degree and are within easy reach. They are positioned where you hands would naturally be on your side. Straight Body Posture – Many elliptical trainers tend to force you to lean forward because of the positioning of your body over the mechanism. On the Horizon Elite E7 your body is in an upright posture resulting in more comfort and reducing the feeling of exhaustion. Natural Elliptical Stride – Rather than an oval, bouncy stride, you get a flat elliptical pattern that mimics running or walking on air. This is also less stressful you joints and your lower back. Low Pedal Height – The pedals are easy to mount and dismount because of their low 10” height. Many find mounting a rear drive elliptical to be awkward and difficult. 20” Elliptical Stride Length – This is a standard stride length for an elliptical over $1,000. It will accommodate the majority of users. Power Incline – Another standard feature on most elliptical trainers. By raising the power incline you target additional lower body muscle, in addition to increasing your cardio exertion and burning more calories. 214 Lb. 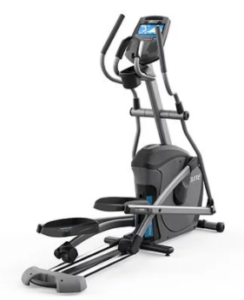 Unit Weight – The advantage of the heavy weight is that the Horizon Elite E7 elliptical is very stable. The disadvantage is that it can be hard to move around. You may want to consider getting inside delivery. Often standard delivery is to the curb. Warranty – The lifetime frame and motor and 5-year parts coverage is standard at that this price. However, many companies offer 2-year labor coverage and Horizon only offers 1-year. Although in comparison to treadmills, elliptical trainers typically have less service issues. See a complete comparison chart of Horizon Ellipticals here. ViaFit – ViaFit allows the Elite E7 elliptical to communicate with the Internet. Through your ViaFit account you can create challenges and track your stats and your progress online. What is also very appealing about the technology is that you also can download stats from popular health, fitness and weight loss apps. ViaFit gives you a central location to review your progress towards your fitness goals, and best of all, it is free. Passport – This interactive feature allows you to workout in a virtual world. There are videos of famous cityscapes and landscapes from around the world, like National Parks. They were shot by individuals with head cams. The speed of your elliptical motion on the Elite E7 syncs with the video. You need to purchase a box and cables that connects the E7 to your television. Passport is designed to take the boredom out of exercising in place. 42 Installed Exercise Programs – You get a wide range of installed programs that control the Elite E7 and are focused on various goals like interval training, calorie burn, distance, performance and step. Plus there is the manual program and two custom. Other features include speaker, MP3 input, fan, reading rack, bottle holder, heart rate monitoring, wireless heart rate chest strap and 8.5” LCD display. This is a heavy duty crosstrainer designed to take abuse. The E7 offers numerous ergonomic features that minimize the stress and strain to your joints and in the process make your workout less exhausting. ViaFit allows you to track stats and progress, and studies show that people who track their stats are more likely to reach their fitness goals. Passport allows you to be more engaged in your exercise routine. It is distracting, which is important when exercising. The features listed above are why the Horizon Elite E7 elliptical trainer is going to be a major contender at the competitive $1,499 price range. You may also want to check out the Horizon Elite E9 for upgraded features. Go to www.HorizonFitness.com to learn more! What is the minimum ceiling height for the Elite E7 elliptical with allowance for head bounce. I want to put it in my basement and I want to know if I have the head room. When I googled ellipticals for low ceiling heights it took me to your website. You will need to add 18″ approximately to your overall height in order to determine ceiling clearance needed.